Annual Percentage Rate - The Annual Percentage Rate is also known as the APR, which is the annual cost of credit that the user will incur on the credit card. The Truth in Lending Act requires that companies disclose the APR to consumers. Asset - Anything that has cash value like an investment, good, or savings account. Average Daily Balance - It is the a way to determine the amount of daily charges. It is found by adding the outstanding balance for every day in the billing cycle and then divide it by the amount of days in the billing cycle. Balance - The total amount of money that is owed by the borrower. It can include fees, interest charges, and the amount of the loan. 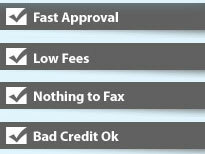 Bad Credit - It means that someone has a poor credit score or rating due to a negative past that may have include missing or late payments, bankruptcies, and defaults. People with bad credit usually have difficult time securing loans. Borrower - The person that is borrowing the money from the lending institution. 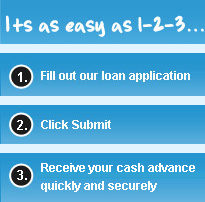 Cash Advance Loan - A short term loan that is designed to keep someone afloat until their next pay day. Amounts for cash advance loans can vary depending the on the lender and the background of the borrower. Checking Account - An account that allows for check writing privileges at the borrower's banking institution. Some lenders require that borrowers have a checking account so they can use it to send the money. Collateral - Assets that a borrower can use as a means to pay off the loans if they are not able to pay for some reason. Collateral could be something like a house or a car and the lender can sell those items to recover the cost of the loan. Cosigner - Another party that signs with the borrower to receive the loan. The cosigner does not receive the amount, but they do assume equal financial responsibility for paying the loan back. Credit Check - It is a credit report from one of the three credit bureau's like Equifax, Experian, or Transunion. It provides detailed information about the financial background of an individual to help lending and banking institutions decide if they should offer them a loan or extend a line of credit. Credit History - Financial information about how a person has paid off their past obligations, their current lines of credit, and behavior. Credit Reporting Agency - There are three main credit reporting agencies such as Transunion, Experian, and Equifax. They all collect financial information about how consumers manage their financial obligations. Creditworthiness - The likelihood that a person will actually repay a loan. This is predicted by looking at how they have managed their previous financial obligations. Credit Score - A number between 300 to 900 and it is used to determine the creditworthiness of an individual. Debt Management Company - A company that will act on behalf on an individual to negotiate lower interest rates and more favorable terms to help them pay back the amount. Default - The point when the borrower has stopped paying back the loan. Deferred Deposit Lending - This is a type of pay day loan when a lender gives the borrower a post dated check to deposit as their payday loan. The borrower will have to pay the amount back within about two weeks. Depreciation - The value that assets lose over time. Direct Deposit - An electronic deposit to a bank account. Finance Charge - The total amount of credit charges accumulated from fees and fees. Fee - Charges that lenders add to the cost of the loan. Interest - A percentage that a borrower must pay to have access to the lender's money. Liabilities - Any money that the borrower must pay back. Maturity Date - The due date for all the total amount of the loan, charges, and interest. No Credit Check Personal Loan - A loan that can be obtained without a credit check. No Fax Payday Loan - A loan that can be received online or over the phone without the borrower having to fax their employment or bank account details to the lender. Over-the-Limit Fee - A fee that a borrower must pay if they have borrowed more money than the limit allows. A fee is administered each month that they borrow over the limit. Payday Loan - A short term loan that is given to people to provide them with funds until their pay day. They are unsecured loans that are usually due within a 1-2 weeks depending on the lender. They can be obtained from online payday lenders, brick and mortar lenders, or even via fax or telephone. Amounts of payday loans often vary depending on the lender and the amount that the borrower requests. Payday Loan Calculator - A special calculator that is designed to help consumers determine the total cost of the loan, annual percentage rates, and interest. Predatory Lending - This is when a lender will hide information from a borrower and trick them into signing up for loans with extremely unfavorable terms and exorbitant interest rates and fees. Prepaid Debit Card - A line of credit that is directly linked to the amount of money in someone's bank account. It will only allow them to spend a certain amount of money from their account and nothing more. Prepayment Penalty - A fee that applies to borrowers that pay the full amount or a portion of the loan back before the maturity date. Principal - The amount of money borrowed in the loan. Rollover - Extensions that allow the borrower to renew their pay day loan. Fees usually apply for a roll over and the law limits the amount of rollovers borrowers can use within a certain time frame. Statement - A monthly financial document from a bank or lending institution that provides details about the account, transactions, and current balance. Truth in Lending Act - A federal law that states that lenders must disclose all terms of the loan to the lender such as APR, interest rates, and fees. Unsecured Loans - Personal loans that can are under a certain amount of money. It can be used for any reason and it does not require the borrower to put up their house as collateral. They usually require the borrower to be employed and provide proof of income. The process of obtaining an unsecured loan is much faster than and there is minimal paper work.